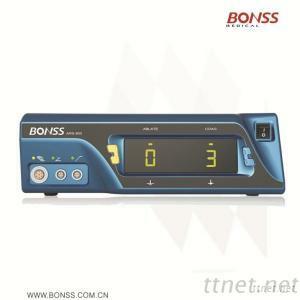 Jiangsu Bonss Medical Technology Co., Ltd. The BONSS ENT Plasma Ablation System (ARS800) is designed for ablation, resection, and coagulation of soft tissue and hemostasis of blood vessels in otorhinolaryngology (ENT) surgery. With advanced plasma ablation technology, the system dissolves tissue at the molecular level in a highly-controlled manner with minimal thermal effect on surrounding healthy tissues. The unique design of plasma probes makes it perfect to ablate soft tissues submucosally during tissue reduction. In addition to a wide selection of plasma probes designed for specific ENT surgical applications, the complete system is composed of a controller host machine, a foot control unit, a treatment handle, a hospital-grade power cord and an optional flow control unit. ·Minimally-invasive plasma ablation and coagulation functions.